A 4-year-old girl presented with a 1-week history of fever, altered sensorium, generalized abdominal pain, and distention. She had a prior history of multiple hospitalizations since birth for repeated episodes of jaundice. Bloodwork showed raised total bilirubin levels (17.4mg/dl) with direct bilirubin 10.2 mg/dl & indirect bilirubin 7.2 mg/dl with markedly elevated WBC count of 15,900 /mm3. The blood ammonia levels were extremely high at 129 mcg/dl and serum galactose levels were raised. A chest frontal view X-ray showed presence of inferior rib notching. Echocardiography demonstrated a juxtaductal coarctation of the aorta surgically corrected by an end-to-end anastomosis. Abdominal sonography revealed a vascular channel formed by the confluence of the splenic and superior mesenteric veins. 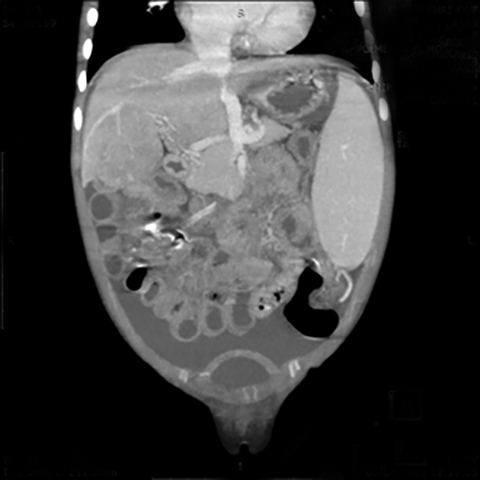 This vessel coursed away from the gastro-hepatic ligament and opened into the infrahepatic inferior vena cava (IVC). The left and right branches of the portal vein and intrahepatic portal venules were absent. Color Doppler ultrasonography showed hepatofugal flow in this vascular channel. An abdominal contrast-enhanced CT scan was performed to evaluate this vascular channel. Axial images demonstrated formation of the portal vein by confluence of the splenic and superior mesenteric veins at the neck of pancreas, but instead of coursing into the liver through the porta hepatis, this vein formed an end-to-side anastomosis with the extra hepatic IVC (Figure 1). The portal vein was absent at the porta and the intrahepatic portal vein branches and venules were not seen (Figure 2). Multiplanar reconstructions allowed accurate depiction of this abnormal extra- hepatic mesenteric-caval shunt (Figure 3). 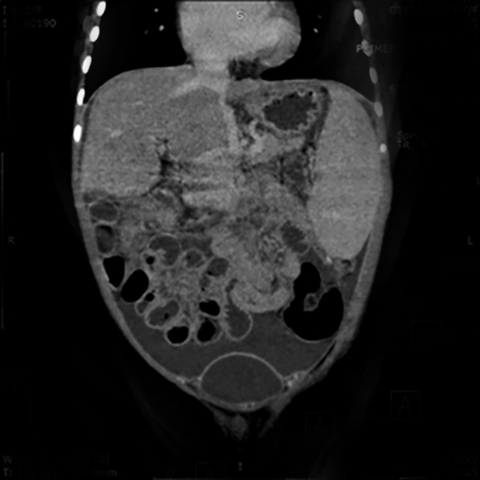 CECT also showed moderate ascites with massive splenomegaly and smooth peritoneal enhancement (Figure 4). Abernethy malformation is a congenital extra hepatic portosystemic shunt (CEPS) that develops between the porto-mesenteric vasculature and the systemic veins. 1 John Abernethy gave the first account of absent portal vein and congenital mesenteric-caval shunt. The basic abnormality is a vascular aberration in which the splanchnic venous return drains directly into the systemic veins (IVC or the left renal, left iliac or left hepatic vein), diverting the mesenteric circulation away from the liver. The portal vein is either hypoplastic or by-passes the liver. The portosystemic shunt disrupts the enterohepatic circulation with deranged metabolism of various substances, leading to adverse clinical manifestations. The clinical presentation varies from hypergalactosemia to hyperbilirubinemia to hyperammonimia due to delayed hepatic metabolism of these metabolites as they bypass the liver in the first instance. Pulmonary venous congestion results in hepatopulmonary syndrome, presenting clinically with dyspnea due to pulmonary hypertension. Hepatic encephalopathy may develop in longstanding cases, clinically manifesting with tremors, extrapyramidal symptoms, irritability and altered sensorium. Regenerative nodular hyperplasia of the liver can also result from the liver’s abnormal response to the absent portal flow and can progress to a hepatic tumor in the form of adenoma, hepatoblastoma or hepatocellular carcinoma.3 A female preponderance has been described and associated cardiac and skeletal anomalies, biliary atresia, polysplenia, and hepatic tumors often coexist.4 Prognosis depends on the presence and extent of associated cardiac or hepatic complications. Computed tomography angiography (CTA) helps to differentiate Type I from Type II CEPS shunts and to categorize Type I shunts into subtypes a and b. CTA with arterial and venous phase isolation allows mapping of the course of the shunt and accurate classification. Proper delineation of drainage anatomy is possible with CTA due to its ability to rapidly scan a large volume of tissue and provide multiplanar reconstructions of the vasculature.7 Catheter angiography is no longer preferred, due to the difficulty of performing an invasive vascular puncture in children and its associated complications. Magnetic resonance angiography (MRA), due to its multiplanar capability and superb spatial resolution, is also an excellent technique to visualize these aberrations and confirm hypoplasia or absence of the portal vein.8 Both modalities can detect hepatic nodular hyperplasia and characterize adenoma, hepatoblastoma, or hepatocellular carcinoma. 9 Both MRI and CT can detect cerebral complications associated with chronic hepatic failure in Abernethy malformation. These are seen as increased signal intensity in bilateral lentiform nuclei on T1W images (manganese deposition in the globus pallidi) and cerebral atrophy. Familiarity with congenital aberrant mesenteric drainage is important to accurately diagnose CEPS and Abernethy malformation. Current CT and MR technologies make diagnosis of Abernethy malformation and other CEPS shunts possible. They also demonstrate the spectrum of findings seen in CEPS shunts far better than conventional catheter angiography, obviating the need for the latter in the triage of mesenteric-systemic shunts. Howard E, Davenport M. Congenital extrahepatic portocaval shunts—The Abernethy Malformation. J of Pediatr Surg. 1997; 32(3):494-497. Marks C. Developmental basis of the portal venous system. Am J Surg. 1969; 117(5):671-681. Akahoshi T, Nishizaki T, Wakasugi K, et al. Portal-systemic encephalopathy due to a congenital extra hepatic Porto systemic shunt: three cases and literature review. Hepatogastroenterology. 2000;47(34): 1113–1116. Yoo S, Babyn P, Murray C. Congenital extra hepatic portosystemic shunts. Pediatr Radiol. 2003; 33(9):614-620. Morgan G, Superina R. Congenital absence of the portal vein: Two cases and a proposed classification system for Porto Systemic vascular anomalies. J Pediatr Surg. 1994; 29(9):1239-1241. Alonso-Gamarra E, Parrón M, Pérez A. Clinical and radiologic manifestations of congenital extra hepatic porto systemic shunts: A comprehensive review. RadioGraphics. 2011; 31(3):707-722. 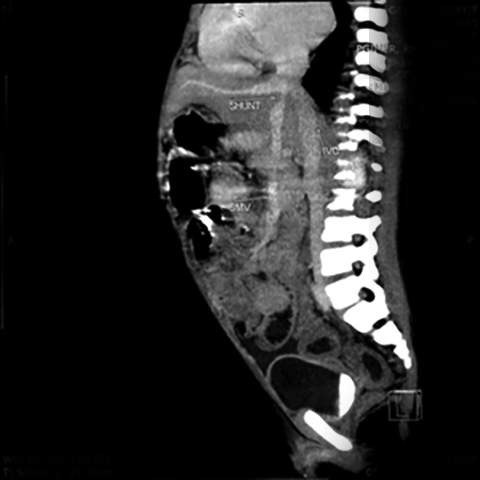 Niwa T, Aida N, Tachibana K. Congenital absence of the portal vein: Clinical and radiologic findings. J Comp Assist Tomogr. 2002; 26(5):681-686. Konstas A, Digumarthy S, Avery L. Congenital porto systemic shunts: Imaging findings and clinical presentations in 11 patients. Euro J Radiol. 2011; 80(2):175-181. 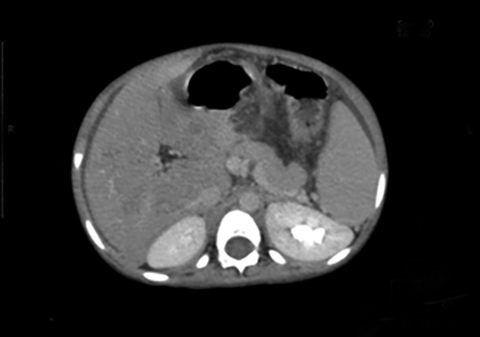 Tanaka Y, Takayanagi M, Shiratori Y. Congenital absence of portal vein with multiple hyperplastic nodular lesions in the liver. J Gastroent. 2003; 38(3):288-294. Franchi-Abella S, Branchereau S, Lambert V. Complications of congenital porto systemic shunts in children: Therapeutic options and outcomes. J Pediatr Gastroent and Nutr. 2010; 1. Lautz T, Tantemsapya N, Rowell E. Management and classification of type II congenital porto systemic shunts. J Pediatr Surg. 2011; 46(2):308-314. Mehra S, Walia S, Karthikeyan MA, Garga UC. Abernethy malformation. Appl Radiol. 2018;47(12):28-30. Prepared by Dr. Mehra while a Professor; Dr. Walia while a Senior Resident; Dr. Karthekeyan while a Resident; and Dr. Garga while a Professor, in the Department of Radio-Diagnosis, Post-graduate Institute of Medical Education and Research, RML Hospital, New Delhi, India. The authors have no conflicts of interest to declare.